We’re happy to share the results of our pre-program survey that many of you filled out when you first heard about CF Yogi. Thank you everyone who participated! Thanks to you, we were able to get some wonderful (and validating) insights about how we can best meet the needs of our CF community. Do you have any parts of your body that feel like they frequently need some extra care & attention? When I (Katie) first started writing about yoga for cystic fibrosis a few years ago, I only had one data point . . . myself. At the prompting of a friend, I wrote an article on my blog about how I used yoga. That connected me with others knowledgeable about yoga and CF. I soon learned about a pilot study of yoga for cystic fibrosis that had been done at Seattle Children’s Hospital, right in my own backyard. I saw that I wasn’t the only one who could benefit from a regular yoga practice. In 2016, I worked with Pactster to develop a series of yoga for cystic fibrosis videos. I learned a lot about what made a yoga practice beneficial to others with CF, and was thrilled when my video classes were verified by the Association of Chartered Physiotherapists in Cystic Fibrosis (ACPCF). But even so, in a pre-recorded video there’s no way for the teacher to see what the student is experiencing. I read every comment posted on my videos so I could learn what did and didn’t work for those students. This year I had my first opportunity to interact with students in real-time. I taught virtual yoga classes for the Cystic Fibrosis Foundation‘s “FamilyCon” and “MiniCon” events. In that virtual setting, I could ask what people were feeling in their bodies beforehand. I could offer options and modifications appropriate to their specific needs during class. We want to give CF Yogi that same immediacy, so that our teachers can support their students’ unique needs on any given day. 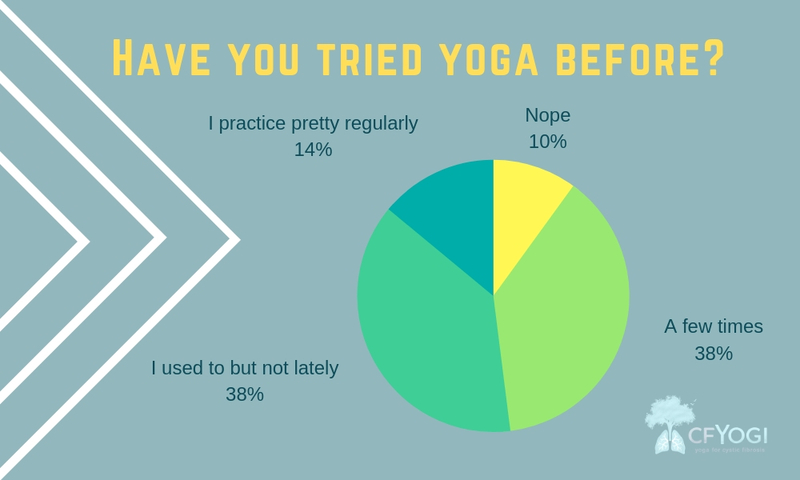 We created a pre-program survey that would allow us to see the physical concerns our future students had, and better understand their obstacles that kept them from a regular yoga practice. The survey was live on our website for over six months, and received responses from both adults with CF and parents of children with CF. Now with this information in hand, we’re able to give our teachers a base of knowledge about the likely needs of the people who will show up in their classes. What holds people with CF back from a regular yoga practice? Motivation is a challenge for everyone, everywhere… whether you have CF or not. Overcoming that obstacle is first on us as teachers. We need to make our classes as enjoyable and beneficial as possible, so that people want to keep coming. But it’s also on our students, to make the commitment to keep showing up even when the going gets tough. At CF Yogi, we have made a Virtual Yoga Studio for people with CF. This week our teachers did their first demo classes for each other. This helped them to get comfortable with teaching in a virtual environment. We also took this opportunity to start discussing these survey results, and the options and modifications that we could offer. For example, a large portion of respondents indicated they had frequent shortness of breath. Our teachers need to be mindful of that, and regularly remind people to listen to and follow their own breath. And we can make sure to use breath-motion flows that maximize available air. Similarly, some people with CF greatly enjoy inversions. Inversions are “upside down” poses where the head is below the heart, which can help move secretions in the airways. Yet acid reflux issues are also quite common in CF, meaning inversions are a bad idea for some people. So when we offer inversions, we need to give verbal reminders about the contraindications or offer an alternative pose where the torso is in a neutral or upright position. As our program launches, we are excited to finally meet our students face-to-face in our new virtual studio. Our yoga teachers are excited to share what they’ve learned, and to continue learning from each other about supporting the whole person with CF… body, mind, and spirit.